"Kleenex was a good friend of mine." I Should Have Had All Along"
I wish I wouldn't have waited so long." is not having done this sooner." Life changes us. It changes our bodies. Change your body for the better. Unlike area surgeons who leave scars on the chest wall, Dr. Bartell performs this procedure through a tiny incision in the armpit, called transaxillary. Dr. Bartell invites you to make an appointment for a no-obligation consultation if you are interested in body re-contouring procedures. Bring all your questions. The results speak for themselves. See for yourself by checking out many actual before and after patient examples. View hundreds more at a consultation with Dr. Bartell. The IDEAL IMPLANT is a wonderful option for patients who appreciate the benefits of saline and have a thin frame to avoid rippling. The implant feel is very natural as it’s placed under the chest muscle. Patients will also notice a comfortable, natural projection. Dr. Thomas Bartell is Madison, Wisconsin’s only board certified plastic surgeon that focuses solely on below-the-neck procedures: breast augmentation and reduction, tummy tuck, arm lift, body contouring, liposuction and labiaplasty. Dr. Bartell is also the most experienced plastic surgeon in the area specializing in breast augmentation that leaves no scars on the breast at all. The focused expertise of Dr. Bartell’s Madison plastic surgery suite makes him highly sought-after; patients choose to travel from all over, including Green Bay and Fox Valley, for plastic surgery. With his dedicated, specially selected surgical team and fully accredited surgical suite, Dr. Bartell provides care that’s highly personalized, safe and private. Take the first step toward your change for the better and schedule a free consultation. 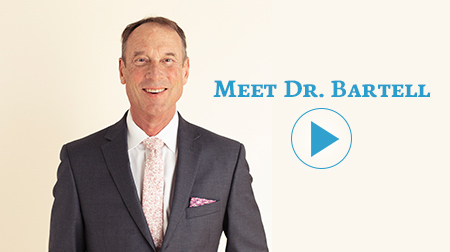 Dr. Bartell is a Board Certified Plastic Surgeon for over 20 years who specializes in below-the-neck procedures. Which means Dr. Bartell does a lot of these procedures. View the before and after photos and see the results. Dr. Bartell operates in a state-of-the-art medical facility and surgery center ensuring his patients maximum privacy, convenience and comfort, without the rigors of hospital admission and the associated costs of an in-hospital stay or procedure. You may be surprised to know that when surgical procedures are performed at hospitals, it’s the hospital that assigns the surgical support team. Surgeons typically don’t know with whom they will be working until the day of the operation. Dr. Bartell hand-picks his surgical team.